A reddish brown spice ground from dried peppers to be made into a sweet, mild or hot tasting seasoning. Several of the key areas producing Paprika include California, South America, Spain, and Hungary. However, the two types of Paprika that are the most flavorful are the Hungarian Paprika and the Spanish Paprika. Hungarian Paprika is considered to be the grade that is superior in flavor. Produced as a fine or coarse ground spice, the Hungarian Paprika is generally available as either a sweet or hot flavored seasoning. Other levels of flavor are produced, such as mild, delikatess, semi-sweet, and special, but are not as readily available. The Hungarian Paprika goes well in savory or rich tasting dishes, sauces, and some stuffings. It can be used with sour cream, noodles, meats, and some vegetables. The Spanish Paprika differs from the Hungarian variety in the way it is produced and processed. 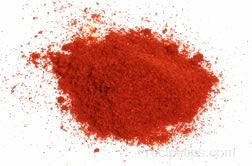 Spanish Paprika is considered to be a smoked Paprika made with either sweet or hot peppers that have been dried over the smoke from the coals of oak logs. As it dries, the smoke imparts an earthy flavor that goes well with food dishes using eggs, beans, potatoes, and roasted or grilled meats. Produced in intensity levels of sweet, bittersweet, and hot, the flavor of the Spanish Paprika may become overpowering if used excessively, so use caution when adding it to food dishes. The hot Spanish Paprika can be added to stews, chili or curries. Paprika not only adds flavor but also color to various food dishes so it becomes an effective garnish when used as a topping for foods such as scrambled or deviled eggs and roasted potatoes topped with sour cream. To increase the intensity of mild or sweet Paprika, simply add a little cayenne pepper.